The Rainharvest School, founded in La Grange, Texas is a unique learning facility offering “Design-Build” classes throughout the year for those who want hands-on, practical experience designing, building and pricing both “dry” and “wet” rainharvest systems. The focus is on practicing building these systems so that you can go home, build your own system and save hundreds if not thousands of dollars. We limit each class to a maximum of eight (8) students, a minimum of four (4). Classes larger than our maximum limit the attention staff can give to individual students; classes smaller than four limit practicing the team project on Sunday. Class begins Saturday morning at 8:30 a.m. (Registration) and ends between 4 and 5 p.m. We start at 9 a.m. Sunday morning and normally conclude between 3:30 and 4:30 p.m. 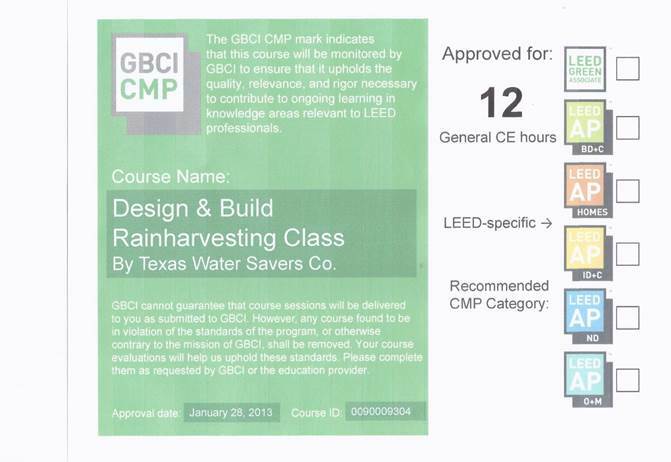 The only “lecture” time spent during our class is on Saturday morning immediately following check-in when we have a short (usually 15-20 minutes) orientation and distribute our “RWH Design-Build Guide” – a step-by-step guide (in words, pictures and numbers) to designing, building and pricing rainharvesting systems. Step 10: Turn it on! Virtually all your class time is spent working with tools, assembling components and building RWH systems. During the class you will be using shovels, tampers, levels, hammers, power tools, PVC (and more) to build a cistern pad, cut and install PVC and drains, assemble a first flush diverter, build a pump pad and install a pump. You’ll water test your system and turn on a pump to see it works. We work very hard to make our instruction simple, easy to understand and easy to do. We don’t use much “lingo” and there’s no question we are not willing to answer. You and your classmates will work together Sunday afternoon on our unique “Design, Price and Pitch” problem. During this part of our class you will meet a typical “Customer” who will ask you and your classmates to design a RWH system for them. You will design the system with your classmates, price the system (wholesale and retail) and choose a class member to “sell” your design to your customer. By Sunday evening you will have practiced and priced (wholesale and retail) systems in “classroom” and “real-world” situations. You have “pitched” a “client” and you know something about rainwater chemistry and quality. Our aim is that you will have the confidence, knowledge and skills to build your own system when you say “Goodbye” Sunday afternoon. Your final “grade” comes after you’ve built your own system and invited us for a “white glove” inspection! We look forward to your call one day. We serve lunch (“family style”) Saturday and Sunday from noon to 1 p.m.
(*) The Guide, provided at no additional charge to class members, can be purchased by non-students for $225 + postage and ordered by calling Scott O. Shaffer (979-250-1239) or emailing (s.o.shaffer@gmail.com). Purchasers of the Guide who have not taken the class receive a $175 tuition credit upon enrollment within one year of purchasing the Guide. We are proud to be able to offer this 12-unit U.S.G.B.C. CEU credit with completion of our RHS Design-Build class. What is your 2016 class schedule? Sorry the blog didn’t send me the email that we had a post to come reply to. I would like to register for the October 15 and 16 class. Please let me know via e-mail. Thanks.